Do you have TONS of those plastic grocery bags taking up space in your house? Most of the time, I take reusable grocery bags to the store for my groceries, but sometimes I forget them and end up with more plastic bags! Ugh! So, what is the frugal option for making use of these plastic bags? 1) Use them as trash can liners. Now, these plastic bags are not heavy-duty, but they are fabulous for using as liners for your bathroom and office trash cans. 2) Pack them in your diaper bag. In case of accidental spills or diaper explosions, you can keep an extra set of clothes in the plastic bag, and if there is an accident, simply swap out the dirty clothes for the clean ones and tie up the bag so there are no leaks. Keep a few for those nasty diapers when you are on the road and there is no other “safe” place to put them. 3) Line your vehicle’s trash canwith them. Or, keep them in the console for quick clean-up after a trip. 4) Tie up dirty diapers before placing them in your diaper pail. Our diaper pail does nothing to hide the smell of stinky diapers, but tossing one in a plastic grocery bag and tying it up before popping it in the pail leaves a much more pleasant odor… or lack thereof. 5) Use them at your garage sale. Next time you have a garage sale, use your plastic grocery bags to place customer’s purchases. If nothing else, use this as a good excuse to have a sale and get rid of some of your clutter. 6) Plastic bags make good packing material…. if the item(s) are not breakable, that is! 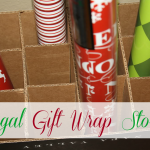 Wrap items to be shipped in plastic bags or stuff them in the “empty” spots of the box. 7) Take your lunch to work by tossing your sandwich (or whatever) into a plastic grocery bag. And, to make it both frugal and green, use the same bag every day. 8) Drain your cooked ground beef with foil and a plastic bag, a’la Balancing Beauty and Bedlam. Awesome trick, eh? You’re welcome. 9) Store wet swim suits after hitting the pool. 10) Recycle them. If the plastic bags are taking up much-needed space in your home, simple recycle them next time you go to the grocery store. Most grocery stores have a bin as you walk in (or near the front) for recycling plastic bags. How do you put plastic grocery bags to use? 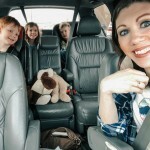 You can find this post on Oh Amanda’s Top 10 Tuesday, 5 Minutes for Mom’s Tackle It Tuesday, and Life as Mom’s Frugal Friday. 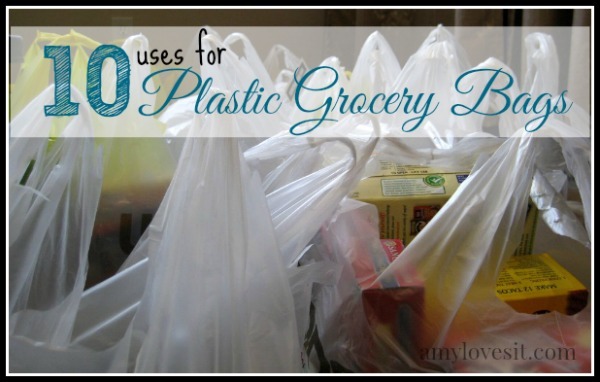 Share the post "10 Uses for Plastic Grocery Bags"
I just found your site and I love it! I have subscribed to the email feed and I look forward to receiving it. Have a praise filled day! I use my plastic bags for putting peelings and garbage in while I’m cooking. It’s like having a garbage bowl, but without the bowl to clean up. I just toss the bag. I have a HUGE basket full of these things! However, they do go to good use…all of which you described: trash liners, lunch bags, but we also use them when cleaning out our kitty litter. I double the bag over and then toss it in the garbage. My daughter actually crocheted a reusable bag out of grocery sacks. It’s very sturdy and the ultimate in recycling! !It’s one of my favorite gifts of all time. I have wadded them up and used them in the bottom of big planters. Othewise, you have to buy A LOT of dirt to fill those up high enough to see the flowers. I will fill it half way with wadded bags and the rest with dirt. Probably not the best idea but I have been doing the flower thing for the last three years and year after year, my annuals look great! I have also kept several in my glove compartment and when I am stuck at a light, I clean the trash out of my car. With kids, there is always trash your vehicle. I use them to line my garbage bowl and when cleaning out the litter boxes. I donate my extra grocery bags to my local food bank. They always need them to put groceries that they give away in. I use them to toss cat litter. Great list of other uses! Thanks for the practical list of plastic bag uses. We generally just recycle them. I will have to leave a couple in the car for garbage and diapers though. I always forget to put them in there. I agree with all … good list & very practical!! I have plenty of reusable bags but I do occasionally end up with a large supply of plastic bags! I use them as a trash bag in the car (hooks over the gear shift), stashed in the car door beside my older son in case of carsickness (been there, done that without the bag! ), and to toss nasty diapers (too). Great ideas. At one time I did not have any plastic bags left in my house. I even have reusable produce bags..lol. We use our bags for doggy waste!! 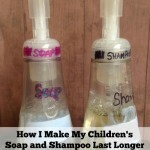 .-= Mommy-Wise´s last blog ..Freebie Friday!! =-. .-= Katie @ Kitchen Stewardship´s last blog ..Kitchen Tip Tuesday: Restaurant-Style Baked Potatoes =-.